My life’s a little hectic these days. It’s crunch time at work, and on top of that I’m taking an American Sign Language class two nights a week, from 6:00 – 8:30. I don’t get home ’til 9:00 on Mondays and Wednesdays, but that doesn’t stop me from booking up my Tuesday evening. Whaddya think – did I have a hot date? Hit up the bars? Get crunk in the hood? Nah. I made crackers. A work friend hosted an Oktoberfest-themed cocktail/beer gathering on Thursday, and I offered to bring “pumpkin-y snacks.” I spent days musing about what to make. Cookies? Mini pumpkin pies? Pumpkin bread? They just didn’t seem appropriate for a cocktail party. Then the wonderful Angela came to my rescue. I was over the moon with happiness when I saw her serendipitous post about homemade crackers. Immediately I thought, “What ho – crackers! I shall make crackers!” and then I thought, “PUMPKIN CRACKERS! I shall make a cracking batch of pumpkin crackers!” And then I scrolled down and saw that Angela, too, had thought of pumpkin crackers – she’d even topped her regular crackers with a pumpkin and EB mixture! Brilliant! So on Tuesday night I took Angela’s flexible recipe into my own hands. I managed to create a batch of some darn lovely crackers, despite nearly getting killed by my microwave (It started up while I had the door open! If I sprout tentacles and become a cracker-eating mutant, YOU’LL KNOW WHY). 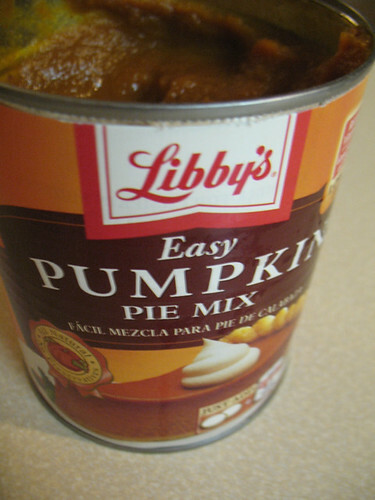 and discovering that a hasty post-class grocery store shelf-grab of canned pumpkin had resulted in something terrible. PUMPKIN PIE MIX. AGH. Of course I only saw the writing on the wall after I’d opened the lid, and then I gasped in horror, causing my roommate to think that the microwave had attacked me again. Never in my life have I purchased pumpkin pie mix! Easy food?! Just add eggs and a can of evaporated milk?! You can’t get any further from my food philosophy than that. The ingredients in this “mix” include something horrible called sugar syrup. I… don’t want to know. I hope it’s just sugar + water. Anyway, I ended up using the pumpkin pie mix, and, to be honest, it’s not really noticeable. Anyway, I modified Angela’s super-flexible recipe a bit when making my crackers. I subbed the accursed pumpkin pie mix for 1/2 C of the almond milk, and I added extra sesame seeds and some hemp seeds in place of the whole flax seeds. I cut down on the nutritional yeast and scratched most of the spices in favor of poppy seeds and rosemary. Then I doused them in the pumpkin pie + EB mixture, sprinkled on some salt, and popped ’em in the oven. I even got to use the adorable teeny-tiny Wilton Halloween cookie cutters I picked up on clearance a few months ago! Can you spot the tiny bats and pumpkins? These are tasty little nuggets. The pumpkin flavor isn’t too pronounced, but that’s okay – they’re complex and yummy nonetheless, and about 1000x better than mass-produced crackers. The rosemary flavor is a little strong for me, so next time I think I’d use a little less. I’d also cook them for longer, and be sure to use a dark baking sheet – the batch I cooked on a light sheet is more chewy than crunchy. I brought them to the gathering, where they were fairly well-received. One girl in particular asked me all about them and said she really enjoyed them. I even served them with a really simple dip, a blend of Tofutti and the pumpkin pie mix. The hostess also served about five types of pretzels and five types of mustard to go along with our Oktoberfest theme, so there was no lack of snacks. Have you ever made your own crackers? Do you generally try to bring vegan options to social gatherings? Maybe the real question here is, what on Earth am I going to do with 8/10 of a giant can of pumpkin pie mix?! Great post, Kelly. I, for one, *love* your use of hyperbole! ;) Yes, I have made crackers–the Cheezy Quackers from 500 Vegan Recipes–they’re delish, and they’re also something I’m not allowing myself to make unless I’m entertaining or taking them somewhere (binge item, lol). And yes, I *always* bring vegan options to social gatherings–I always know there’s something for me to eat, and it shares vegan goodness in a positive way w/ the omnis. P.S. I have *no idea* what to do w/ the rest of that pumpkin pie mix. LOL! I haven’t made the Cheezy Quackers yet…! I’m workin’ my way through the mix. I added it to oatmeal the other day, and I’m almost ashamed to admit that it was kind of delicious. Wow! Homemade crackers are something I have never ventured! Fab idea! Pumpkin crackers have to be a stroke of genius…I can easily see them replacing those ubiquitous gold fish! 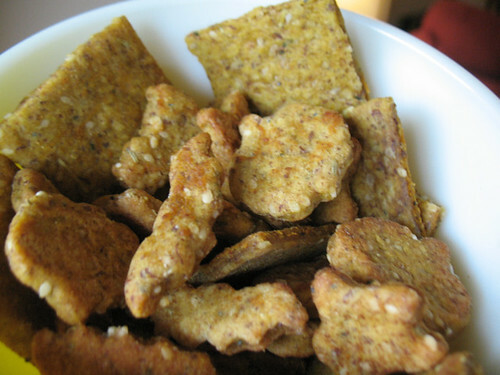 Bring on the vegan version of mini gold fish crackers: mini pumpkin crackers. Hmmm, what to do with rest of the mix? Compost? I love making crackers! It makes you feel so accomplished. And your food snobbery has it’s place, I understand. I always love how befuddled people are when I talk about baking at work, “Wait, you made this from scratch? You didn’t use a mix?” Heaven forbid you blend FLOUR and BAKING POWDER and BAKING SODA! Why on earth would you do that when you could have all sort of chemical leaveners and dough conditioners in your cake? I’ve made the pie mix/pumpkin puree mistake myself, and other than being a tad sweeter and having a gross ingredient list, it really isn’t noticeable. Mmm, dough conditioners! I get cravings for that ALL THE TIME. Oh wait. Yeah, I’m workin’ my way through the rest of the can, slowly but surely… my guilty pleasure is adding it to oatmeal.